Howdy friends! Renee here, from Fantastic First Grade Froggies. It is a crazy, busy time at school so my post is kind of a reminder of a free product of mine that may be useful for Thanksgiving time. My Find, Tally and Graph activities are by far my most popular math tub among my students. I have made one for just about any theme. Click here to see all of the choices. 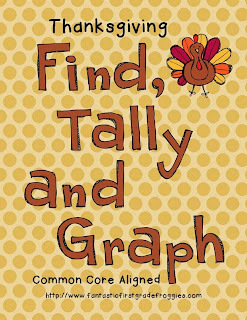 One of my first ones was This Thanksgiving Find, Tally and Graph. Hop on over a grab this freebie if you haven't yet! Click the picture above to get to your freebie.